The Mariner's ship gets stranded in Antarctica and a helpful albatross (which is, apparently, a type of bird) leads the crew out of harm's way... and then the Mariner takes it out with his cross-bow. No reason, he just feels like it. Obviously, the creepy sea spirits get pissed and curse the whole crew with devastating thirst. There is "water, water, every where, nor any drop to drink." The crew blames the Mariner and makes him wear the dead albatross around his neck. A dead bird. Around his neck. Blech. I'm going to stop there because the poem isn't called "epic" for nothing, and I'm bored of summarizing it. The point is, I really related to the Mariner on my trip to Costco today. 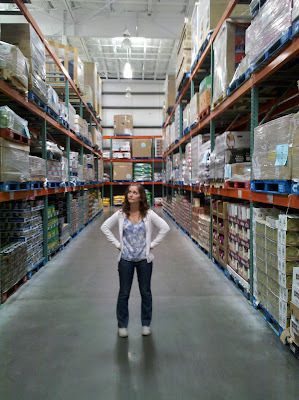 I tagged along with my dad and my Uncle Stephen because I was interested to check out what kinds of vegan treasures Costco might carry. Obviously, there is a huge produce section (some of which is organic), a lot of different nuts, and a whole aisle of bottled water. But aside from that, Costco's vegan options are pretty much non-existent. There I was, standing in an enormous warehouse of bulk food, and there was nothing for me to eat. Somewhere along the way, I must have killed an albatross. I wouldn't be surprised - I've done a lot of weird things. I wandered up and down the aisles, feeling lost and depressed. There were sample tables set up at the end of every other aisle, some nearly overwhelmed by hoards of people desperate to try a quarter of a lobster ravioli, but none of the samples was vegan. I had wandered to the farthest reaches of the store, beyond the walls of toilet paper rolls. It was then that I looked up and saw it: an unassuming sample table manned by a nondescript Costco employee. There was no line. And in each of the little paper cups arrayed in rows was a blob of Summer Fresh Tuscan Bean Salad. It was delicious and it was vegan! I snatched up a tub of it immediately. Its ingredients are: barley, navy beans, chick pea, green pepper, red pepper, green onions, canola oil, sundried tomato, pesto sauce, garlic puree, white vinegar, sea salt, spice, citric acid. I just ate some for dinner in a wrap with hummus. After finding the Tuscan Bean Salad, I gained confidence and was able to discover a few more vegan options: Edy's all-natural fruit bars, Sambazon acai juice, and a very large bag of quinoa. I really disliked feeling like a vegan mariner, stranded among insane amounts of food but unable to eat any of it, so I'm not going to invest in a Costco membership back in California. But I know every Costco is different and that the stores switch up the products they carry quite frequently, so maybe I'll venture back in after a while. And now, go like one that hath been stunned and is of sense forlorn. A sadder and a wiser (?) man (or woman), arise the morrow morn. I would eat that stuff! I'll look for it but, like you, Costco isn't really a practical option for me. in high school because of the Iron Maiden song! So, I "got" this post. As the spammers are fond of saying, nice blog! "You have lots of useful information for people!" I can completely relate to this post! I went with my mom to Costco a few weeks ago and thus had the same fate. All I could find were some colorless and very tasteless Veggie Burgers. What could I do? It was either that or a 24hr watermelon diet. Wendy M: I think I've tried those tasteless veggie burgers :) I'm glad you like the recipes! More to come tomorrow. Wendy, I think I've been on the Watermelon Diet! When you live alone you have to eat it for breakfast, linch and dinner!